Last week, a coalition of bipartisan lawmakers in the US House and Senate introduced identical bills (HR 3494 and S 1708) -- the Bicycle and Pedestrian Safety Act -- to help reduce the number of bicycle and pedestrian fatalities on American roadways. 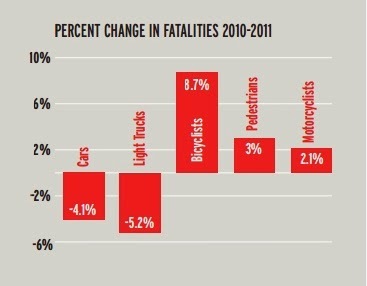 Between 2008 and 2011, overall traffic deaths in the US decreased by over 15%; however, during that same period, pedestrian and bicyclists fatalities increased from 12% to 16% nationally. 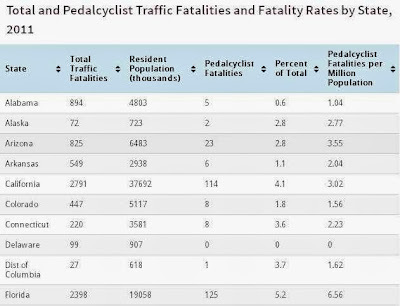 In New Jersey, that number reached 27%, making NJ the second worst state for bicyclist and pedestrian fatalities. 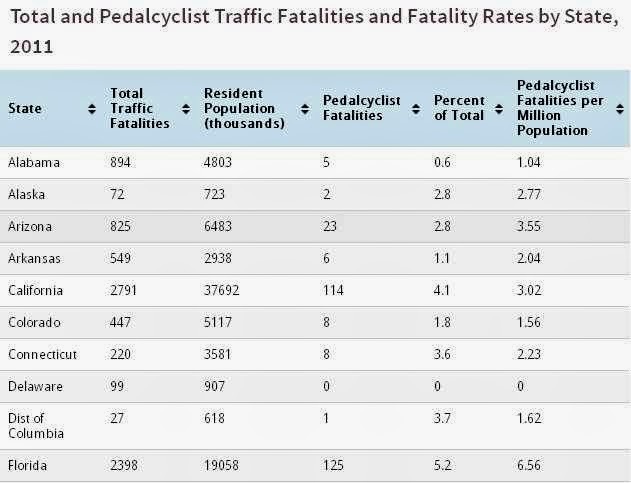 Poster's note: I can find nothing on line with regard to Delaware bicycle fatalities in 2012.We had zero in 2011, as per the chart below, found here.